Berberidaceae includes approximately 15 genera of herbs and shrubs, which are widely distributed in north temperate and tropical montane regions, primarily the Andes of South America. Plants often have a yellow sap which is toxic. Leaves are simple, sometimes deeply lobed or compound. Flowers are bisexual and radially symmetrical. The 4-6 sepals are free. Petals, or probably, petal – like stamens are free, often in 2 whorls of 4-6. Stamens are 4 to numerous. Nandina includes a single species of shrub from mild temperate areas of China and Japan. It is commonly grown in mild temperate and subtropical regions of the United States. Leaves are tripinnate. Stems are erect more or less covered with persistent leaf bases. Nandina has a dainty, somewhat bamboolike habit in broken or filtered light. Unfortunately, it is often prunned as a hedge, leaving a clump of grace less, stiff, bare stalks. Nandina is not a satisfactory hedge plant because it branches mainly from the base. It should be allowed to grow naturally. Thin unruly or overly long branches at the base and allow room to spread somewhat. It makes a superb container plant for the patio. It is weedy in mild temperate regions but is known to be a pest in South Florida. Southern China, Japan. Semideciduous shrub to 5 ft, zones 7-10. Blooms spring, summer. Regular moisture. Average, well – drained soil. Full to part sun. Flowers: small, white, berries orange. Leaves: tripinnate, turning red in cold temperatures leaflets ovate to lanceolate, in 3s or irregularly lobed, to 2 in. long, tips acuminate, clustered at the ends of erect branches, persistent petiole bases sheath the stem. 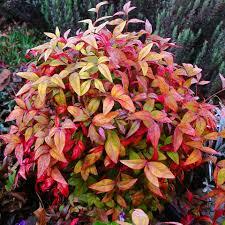 Nandina becomes deciduous when dry or cold. Develops a dainty bamboolike habit with long arching leaves in favorable conditions. Dwarfforms are available. True bamboos are in the grass family, poaceae.